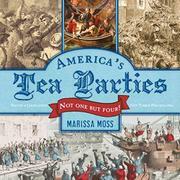 Moss reminds readers that the tea parties of the 1770s were not strictly a Boston affair, no matter how much the city enjoys its spuriously unique association. Like the powder alarms that peppered the Colonial countryside, there were four serious “tea parties” that met the ships of the East India Company in 1773 and 1774. Evincing Moss’ bright and smart research work, this story of the various tea parties is embellished with lovely period maps, political cartoons and broadsides, prints, and paintings by John Singleton Copley and Joseph-Siffrede Duplessis. As well as covering the instigations and outcomes of the parties in Boston, Philadelphia, New York, and Charleston, North Carolina, Moss adds boxed items to throw particular light on the Sons of Liberty, coffeehouses, the East India Company (“with great wealth comes great temptation. And great temptation often leads to gross corruption,” a very telling example of a corporation “too big to fail”), taxation, and tarring and feathering (she lets the Bostonians off the hook—it “rarely caused permanent damage”). Moss adds political commentary that is both stirring—Benjamin Franklin writing that England’s Parliament has “no idea that people can act from any principal but that of [self]-interest”—and provocative, as with her own question to readers: “What price does a moral standard have, after all?...What principals are worth paying for?” That meant taxation without say to Colonials; we might ask ourselves about working conditions and terrible wages.